This is what happened one day. I didn't exist. Then, I did. There's no real explanation for it. I came out of nowhere. But I guess that's how it works. Things appear and then disappear in the world with no explanation. I'm here, and then I'm not. I stop existing and then, at some point, I go back into existence. My father appears out of nowhere. He says “hi,” then disappears. It means that, at a given moment, I don't have a father or anything and then, for about three seconds, I get one who looks at me, says “hi,” and then things go back to how they were. Now and again something else materializes, like a tree or a street post, but these things don't last long. Even the ground does that; most of the time, I'm tumbling through the void. It's hard to say if I'm falling up or down―since there's nothing here, I can't really tell. Every once in a while an object appears and I think, “oh, it's coming from below, so I am coming from above.” But then, another object emerges, “falling” in a different direction, from right to left, relative to the previous object and I get confused again. On rare occasions, the ground materializes. I fall on it, but I'm not hurt. Usually, there's nothing on it. It's a white floor, apparently very clean. I walk around a bit, enjoying the experience while it's there. Then suddenly the floor disappears from under my feet and I fall in an unknown direction again. I don't feel hungry, since I barely expend any energy. I feed from the eatables that occasionally appear near me: fruit, meat, eggs, candy. Honestly, I sometimes wonder how do I know the name and purpose of things. For as long as I can remember, I've been falling through this white space. Nobody ever taught me anything; I've never even had a proper conversation with anyone, because people come and go mysteriously―there's no time to forge any sort of intimacy. I must have learned how to speak (and think) from these brief episodes of human interaction and from the few books that landed in my hands. I read a few grammars and dictionaries, so I learned how to add up all the information and form logical thought. Before this, I thought only in muddled concepts and words, and the then-nameless random objects that went past me. I'd like to know how other people live: what do they do, how do they think. Do they live like me, wandering around in their own solitary dimension, away from everyone else? I spend most of my time trying to escape. Someone who passed by me once told me there are portals to other dimensions, and that I should look out for them. I've also heard stories about how it is to live there, their colors, smells, objects and laws. In some, the floor is always there, you can always walk instead of falling through the void most of the time, as I do. They say that, in these dimensions, there can be a society―something I've never seen―where people coexist, build their lives and, together, move forward. In yet another dimension, people are born glued to another person. Everyone has someone else stuck to their back. They don’t necessarily get along, but must learn to live in harmony. They have to figure out together where to go and what to do, since one will always have to go along with the other. There are also saturated dimensions. In mine, things appear and disappear, so there are very few objects around. In the saturated ones, what appears never goes away―objects emerge and pile on each other, making these places just a cluster of matter. In these dimensions, only microscopic life endures, but in the end, all life tends to be annihilated. I was told there are dimensions in which living organisms are always born one inside the other. Some managed to adapt, but that doesn't work for people. When a human being appears, someone else has to die. Accordingly, the human population in these dimensions is composed of merely three or four people. It's hard to say how many people live in my dimension. Things are very erratic here. How can you obtain statistical data on a place where existence itself is unstable? Something that exists now may no longer exist in five minutes’ time; where I live, you can't count on anything. I'm getting closer to a dimensional portal. I try hard to get closer. If there was a floor, I could walk there. But swimming on the air doesn't help me much. Behind me, someone is approaching in high speed. We bump into each other; I'm thrown far away from the portal while he gets closer. To his dismay, the portal disappears before his eyes; he is sad and desperate. To my surprise, that person soon fades as well. I wonder where we go when we're no longer here. It's kind of like sleeping or fainting: I can't remember what happens when I disappear. I wonder if I show up in another dimension? It could be; I read on a book that, in some dimensions, memory is either nonexistent or short-term, like a dream we forget soon after we wake up. Where did these books come from? They couldn’t possibly have been made here; the books certainly came from elsewhere. Probably, these books disappeared from another dimension and reappeared here―unless someone has crossed one of those portals holding one of them, which is unlikely, since you show up naked whenever you cross dimensions. I read it somewhere. Thing is, I don't know anyone who has ever crossed a portal. I don't even know anybody who knows someone who has managed to do it. So it's quite possible that this portal thing is just a myth, that they are useless. Maybe there are no other dimensions; maybe people just need to hold unfounded beliefs to remain sane. The years go by, nothing happens to me. And there's nothing I can do to make something happen. I wonder what the point of my existence is, since all I do is wander around this empty place. I'm almost dead; forever in the void. RAFAEL SPERLING was born in 1985 in Rio de Janeiro. He is a songwriter and music producer. He studies Songwriting at the Federal University in Rio de Janeiro. In 2011 he published his first book, entitled Festa na usina nuclear [Party at a Nuclear Plant], which was followed by Um homem burro morreu [A Stupid Man Died] in 2014. 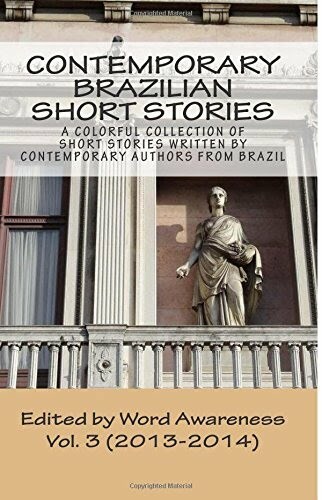 His short stories have been published in several sites, including Cronópios and Musa Rara, as well as Minotauro magazine and Rascunho newspaper. He also writes a blog called Somesentido [Sound and Sense / Disappearing Sense].